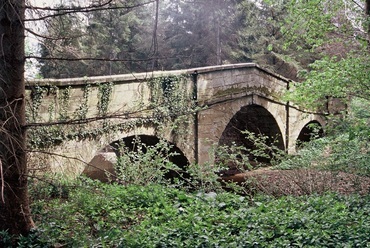 The elaborate Woodhouse Bridge crosses the River Laver, that is little more than a stream in the middle of woodland, at Laver Banks. It was built on the carriageway that linked William Aslabie's estates of Studley and Hackfall so that he could travel the eight or so miles with his guests and give the illusion that his land extended that far. The bridge is of similar design and date to the one near Rough House, at Spa Gill.